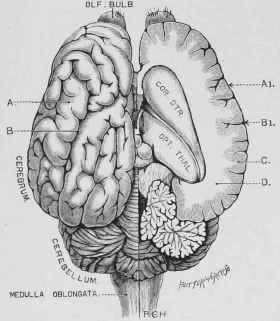 The large mass of nervous substance which fills the cavity of the cranium or skull, to which the term brain is ordinarily applied, in reality consists of two parts - the cerebrum or brain proper, and the cerebellum or little brain, the proportion of these organs to each other by weight being about as 7:1. Both together weigh in the horse about one pound and a half, which, as compared with the weight of the body, is about as 1: 600, or about 26 grains for each 1 lb. av. of body weight. The Cerebrum, or brain proper, is divided by a deep fissure running from before backwards into two lateral halves. It consists of an immense but thin sheet of gray nerve substance externally, chiefly composed of nerve-cells, and internally of a mass of white substance composed of fibres proceeding from, or running to, the cells of the gray substance. 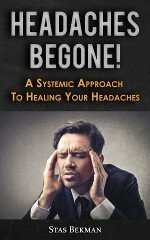 Externally the brain is covered by three protective membranes, as well as by the bones of the skull and skin. These three membranes are the pia mater, which is closely attached to the brain, and is composed principally of blood-vessels; the arachnoid, which is a serous membrane, and is next outwardly placed; and the dura mater, which is a tough fibrous membrane, and lines the interior of the skull. The outer layer of gray nerve substance being very much larger than the surface of the brain, is folded, and, as it were, crumpled, and made to dip down some distance into the organ. The folds are named convolutions (fig. 175 a), and the depressions or grooves between them sulci (fig. 175 b). The convolutions appear at first sight to be quite irregularly disposed, nor will their arrangement be found exactly the same in any two brains; yet by tracing their development, and by observing the effects of injuries, a general similarity has been demonstrated in their position, and the function of each has become pretty well known. If the brain be sliced horizontally a little below the level of the corpus callosum, a cavity is opened on each side named the lateral ventricle. These two ventricles are separated by the septum lucidum, but communicate with each other anteriorly, and with the third ventricle by the foramen of Monro. The floor of each lateral ventricle is formed by the corpus striatum in front, and the optic thalamus behind, and upon these lie numerous blood-vessels forming the velum interpositum and choroid plexus. The third ventricle is situated between the two corpora striata and optic thalami, and is crossed by a gray and two white commissures. Behind, it ends in the aqueductus sylvii, which is a tunnel running underneath the corpora quadrigemina and pons, and opening behind into the fourth ventricle, which is again continuous with the central canal of the spinal cord. The cerebellum is situated behind the brain and above the medulla oblongata. Its convolutions are more numerous than those of the brain, but present the same crumpled disposition of the gray and white substance, the gray forming the external layer and the white the internal. The tree-like appearance presented when the cerebellum is cut in half has been termed the arbor vitas. Fig. 175. - Upper Surface and Horizontal Section of the Brain. A, Ai. Convolutions. B, Bi. Sulci, c, Gray Matter. D, White Matter. COR. STR., Corpus Striatum. OPT. THAL., Optic Thalamus. The cerebellum is divided into two hemispheres, and a central portion named the vermiform process. At its base the white fibres forming its fibrous substance are gathered together into three great strands, groups, or peduncles, on each side; the lowest or most posterior connects it with the lateral columns of the spinal cord. The middle group forms a great part of the pons, and crosses to the opposite hemisphere, while the third group runs forward to the cerebrum. We have seen that forty - two or forty-three pairs of nerves arise from the spinal cord. Twelve more pairs arise from the brain and parts within the cranium, and are termed cere-bral nerves. From the importance of the parts the latter supply they have received distinctive names, and appear in the following order: - 1. Olfactory, or nerve of smell. 2. Optic, nerve of sight. 3. Motores oculi, nerve of motion to the muscles of the eye. 4. Pathetici, distributed to the superior oblique muscle of the eye. 5. Sensory motor nerve, supplying the skin of the head and face with sensation, and the muscles of mastication with motor nerves. 6. Abdu-centes, supplying the external rectus or straight muscle of the eye. 7. Facial, supplying the muscles of expression in the face. 8. Auditory, the nerves of hearing. 9. The glosso-pharyngeal, supplying the nerves of taste and some of the muscles ministering to the act of swallowing. 10. The vagus, which supplies the pharynx and larynx, the trachea and oesophagus, the lungs and heart, and the liver and other viscera with fibres, some of which are motor, while others are sensory. 11. Spinal accessory, supplying some of the muscles of the neck and shoulder. 12. The hypoglossal, supplying the muscles of the tongue. Fig. 176. - Longitudinal Section of the Brain. A, Cerebral Convolutions. B, Section of the Corpus Callosum. c, Section of the Fornix. D, Septum Lucidum. E, Internal Extremity of the Hippocampus. F, Vena Plena conveying Blood from the Choroid Plexus and Velum Interpositum. G, Pineal Gland divided. H, Gray Commissure. I, Anterior White Commissure. J, Corpus Albicans divided. K, Section of Optic Chiasma or Optic Decussation. L, Pituitary Gland. M, Medulla Oblongata in Section. N, Valve of Vieussens in Section. o, Aqueduct of Sylvius. p, Section of Cerebellum. Q, Fourth Ventricle. R, Section of Pons Varolii. 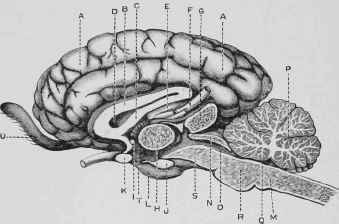 s, Section of Crura Cerebri. T, Foramen of Monro. u, Olfactory Lobule from whence spring the Olfactory Nerves.